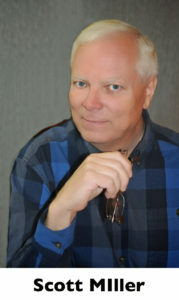 Scott Miller’s music has been performed from Oregon to Greece and selections have been published by Editions Musica Ferrum in London, England. Born in Minnesota in 1962, he has been composing since 1975. As an undergraduate he studied composition with Paul Fetler at the University of Minnesota, and in 1992 earned the M.A. in composition and theory from the U. of M. under Dominick Argento. In 1994, he earned the Master of Library Science degree at the University of North Texas. Also an experienced cellist, he has played in orchestras in California, Texas, Minnesota, and Oregon. “Dialogues” is a work in two movements taking the orchestra in a sort of anthropomorphic direction. Each movement describes easy to imagine types of real life dialogues. The first movement takes us into a trumpet lesson, though it can be imagined as any instrument. The teacher (bassoon) makes his interjections as needed when the student tries his music and misses the mark. With each attempt the teacher becomes more ruffled and the student is puzzled about what he’s supposed to do. The orchestra describes the discussion, and then the teacher asks the student if he’s ready to try again. The tension mounts until the student decides to be brave and takes another try. Now the melody comes out perfectly and everyone celebrates the achievement.